Last week we had a big purple mood here in boutique. 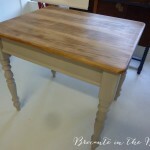 I pulled out one purple hued Chalk Paint TM decorative paint by Annie Sloan and soon that was followed by another and another ! Mixing purples and greys was our colour theme for the week. Paloma. I love Paloma, it is delicate and a touch sophisticated, not just another lavender colour. 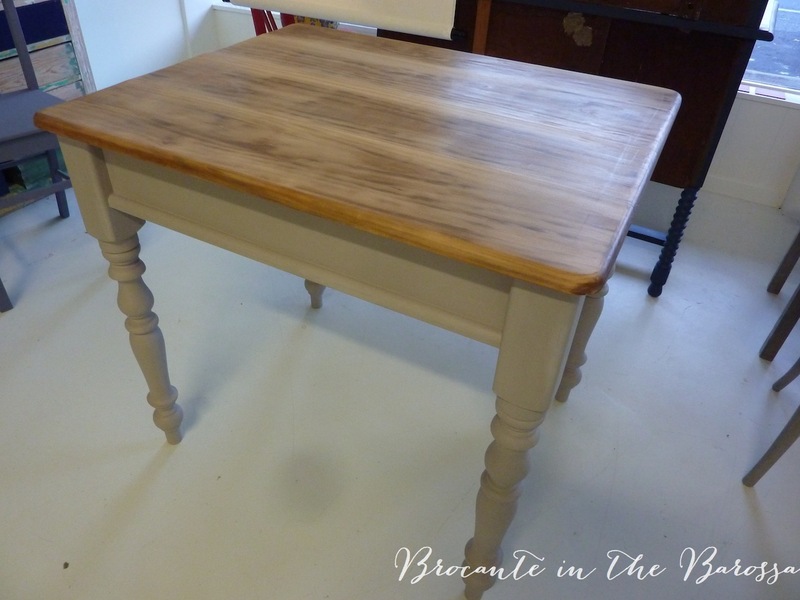 I have used it straight before but this time I mixed it with French Linen to create a very sophisticated neutral that I painted on the base of this small farm style table. 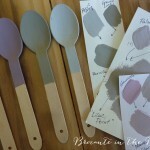 Inspired by Kevin McCloud’s book Colour Now, in vignette 23 on page 57 he says purplish greys are interesting, flatter flesh tones, and bring natural woody materials to life. He says they should be more popular than they are. I can see why. 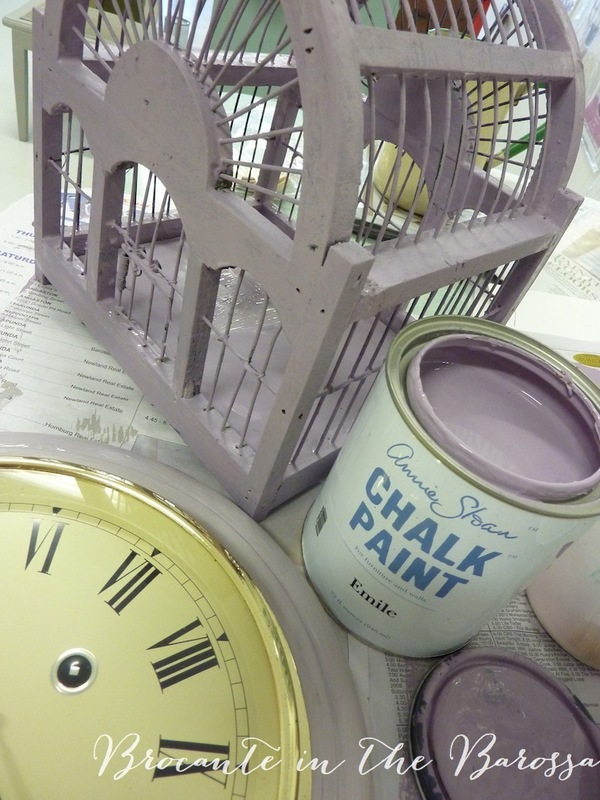 Emile is a deeper hued purple than Paloma and is a lovely rich mid tone colour. I used it on an small vintage atrium shaped birdcage. So cute too. 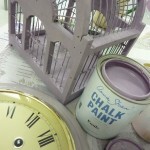 A warning though–painting a bird cage is a fussy little job. I kept finding bits I missed and for two days my hands and forearms were covered in purple paint ! Then I got a bit braver and mixed into Paloma and Emile a colour I have not used before: Henrietta. Not sure why, but it seemed a bit sugary and bright to me and so I just have not picked it up for other projects. But it is a nice bit of relief from the straight purples, as it is sitting the fence between purple and pink. So it is a little shot of brightness next to Emile and Paloma. I layered Emile and a mix of it and Paloma on the frame of a carriage style clock. The gold tone edge by the clock dial had a bit of a pinky mauve tarnish on it, I think this was my inspiration to use purples on its frame. But as with my other clock frame projects, I aim for a layered mix that is not all single toned. So when I got to the top layers, I added Henrietta into the combination. I worked it into the other colours on surface, before they were dry, to blend it in, without fully mixing it. This gave the paintwork a bit of dimension. 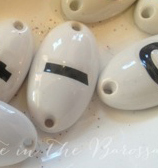 Then some light distressing exposed the darker Emile in a few spots. And then clear wax finish followed by dark wax for a warm look. 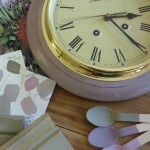 I call the paint work on this clock Heather Mists. 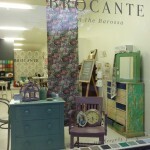 We wrapped up our purple week with a window display in soft dreamy colours. Duck Egg Blue and these purples & mauves. Plus Bison ceramics in colours Leaf, Fig, Sage and Milk.